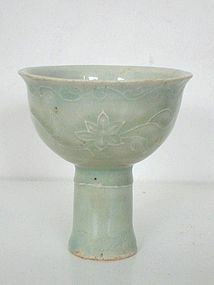 Qingbai stemcup with moulded decorations. China, Yuan Dynasty (1279-1368). H. 9 cm. Diameter 8,5 cm. Condition: age cracks in the glaze, no hairlines, chips or repairs.